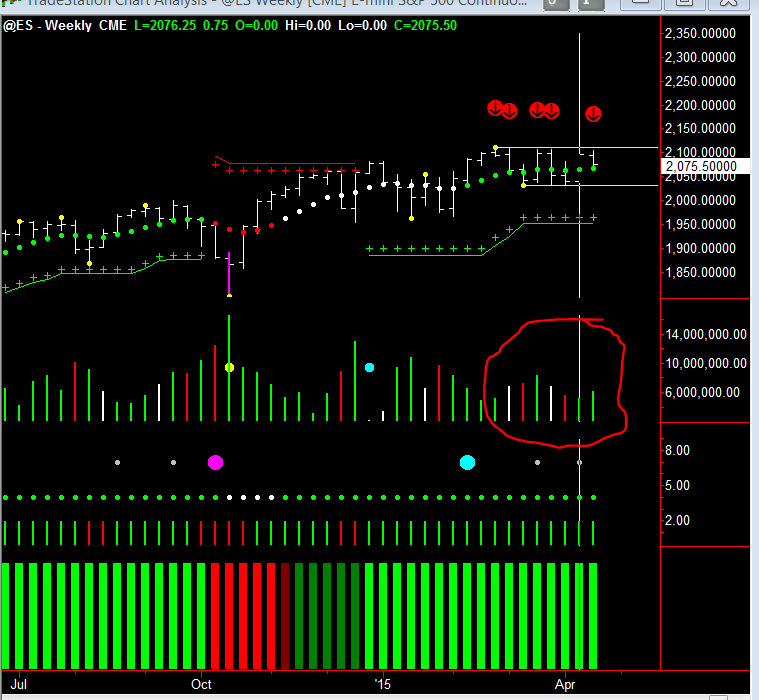 Let’s begin this week’s newsletter by looking at the weekly chart of the ES. As you may remember a week ago, I said that we were in a topping formation on the S&P. And we can certainly see this in this weekly chart. Notice where I’ve placed those red arrows at the top of the chart and how they are all bearing down on where the Hawkeye top pivot is. (That’s the yellow line extended to the right, and underneath the red arrows). Now that pivot was put into place on February 27, and since that time, we have been visiting that price area five times. Also, notice how the trend dots have gone flat, indicating congestion. 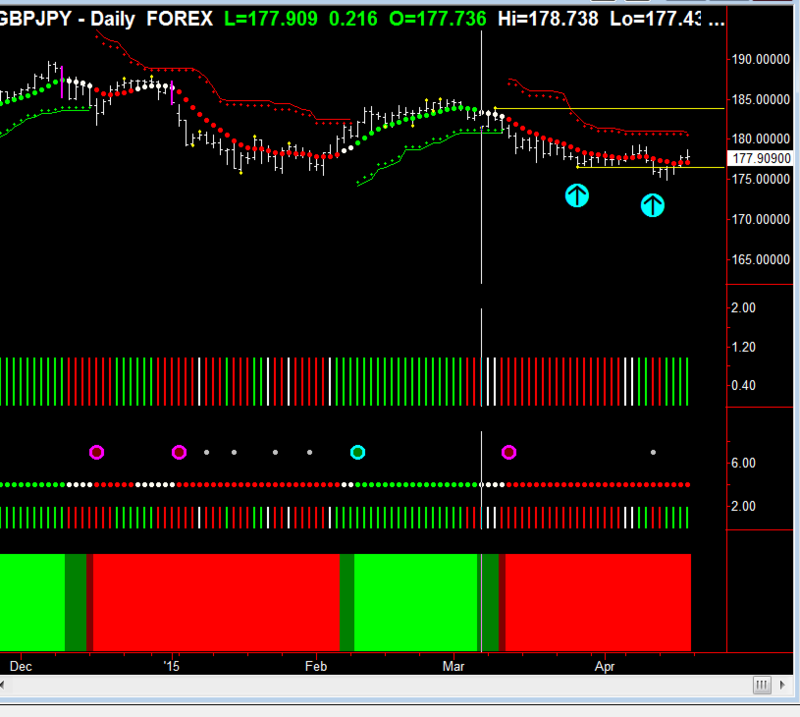 So, we have our congestion parameters set up there between the top and bottom pivot line extensions. Also, notice where I’ve circled the volume at the bottom. You can easily see how that is indicating total distribution volume, where it is alternating between red, green, and white. Of course, when you are in trend runs, you get nothing but green and white volume and an occasional red testing volume to test whether the market is solid. But this time, the market isn’t solid, and it’s going sideways. So, it has to breakout of that pivot high extension (the yellow line to the right), to show that we are in the trend. At the moment, we are in congestion, and you can play this quite easily on your daily charts by knowing where those two levels are, and selling it when it approaches the top line, and buying it when it approaches the bottom line. But, that is a skillful and more advanced trading skill then trading a trend run. But, knowing where you are in the market, certainly helps your intraday trading too. Now, let’s look at our second chart, which is the GBPJPY. Last week, I indicated there was a potential trade to the downside coming, and that was indicated where the second blue arrow was pointing up. And if you remember, I said that if it breaks underneath that bar (the yellow pivot line), with no part of it touching it, then we have a breakout to the downside. I also said that those who are aggressive traders could trade that pivot extension break, if there was a close underneath it. But, as you know, being aggressive means you are taking on more risk. And sure enough, it never happened, because after the second arrow, you can see the price went up to the pivot extension, indicated where I placed the first blue arrow. You can see that that yellow pivot line extension, it went up and visited it again, and the close was greater than the open, so it would have totally invalidated any entry. The next day, it went up and actually straddled the price line again. So, you can see that now, volume is coming in to the upside, and it will be pushing it up to probably test the Hawkeye stops, where the red cross is above the price. So, pivots and their pivot line extensions are very important and should be considered as elastic bands and not as rods of steel. So, if you are doing swing trading or position trading, always wait for a break where no part of the bar touches the pivot that was last formed. Also, remember the other Hawkeye rule that we use, and I’ll give an example of an uptrend here. The close has to be greater than the open and in the top 40% of the range. So, in summary, to really understand the power of the Hawkeye pivots and their extensions, you can see in these two examples we have been talking about in our recent newsletters have absolutely played out, and have kept you safe in the market. Ultimately, they have shown you where the market is and how to trade it accordingly.